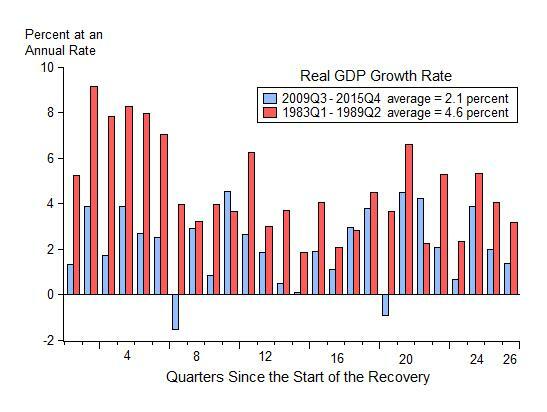 At the end of this quarter, according to most economists, the U.S. economy will have completed 7 years of so-called expansion (28 quarters from 2009Q3 to 2016Q2) with an anemic annual growth rate of 2 percent. I have been writing about the persistence of this slow crawl—along with anemic productivity growth, anemic employment growth, anemic income growth—since the recovery’s early days, and blaming government economic policy all the way. See the list below of 30 posts on EconomicsOne.com which have also considered counter arguments from “weak recovery denial” to its just “secular stagnation” (click on “Slow Recovery” category in box over on the left for details). But people’s exasperation and anger about the economy and Washington policy revealed in this presidential election proves the point better than any abstract statistic ever could. Many people are hurting in many ways. It is a tragedy and policy should change. For many, it’s economic exasperation rather than economic expansion. Here is an update of a graph I used early on to compare this recovery with the 1980s recovery. And here is an update of a graph that makes the same comparison using the change in the employment to population ratio. The recent performance pales in comparison as does economic policy. Compared with my charts in previous posts, it’s really “same old, same old” for GDP growth and while, if you look closely, you can see a welcome uptick in the employment to population ratio, even at that pace it will take many years to close the gap. 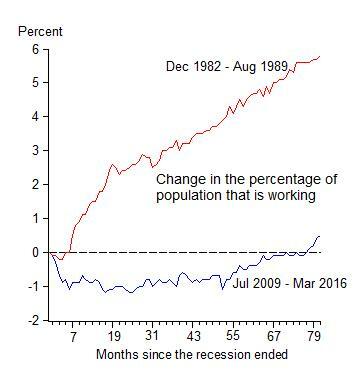 *David Wessel ‏@davidmwessel answered this question in a tweet on Aug 12, 2013: “John Taylor wonders what to call this very slow economic recovery? Suggest ‘The Great Delay’?” But after three more years, and seven years and counting, I think there’s “Waiting for Godot” absurdity to David’s suggestion.